Shimla : After launching the 66th State level Van Mahotsav at Kotla in Shimla Rural Assembly segment of Shimla district, Chief Minister Virbhadra Singh said that the decision of the State Government to completely ban the felling of green trees since 1986, though had resulted in loss of rupees 22 thousand crores of State’s revenue, yet we were satisfied and successful in saving thousands of trees from being axed resulting in increase in forest cover during the last two decades. 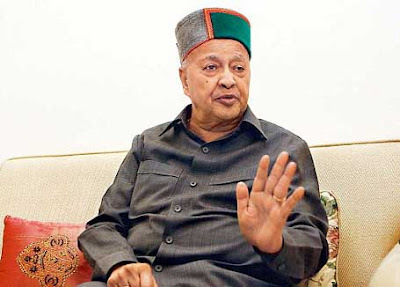 Virbhadra Singh said that before he became the Chief Minister thousands of trees were axed for making wooden cartons for transporting apple crop resulting in huge loss of forest wealth and the forest mafia in garb of this mechanism use to flourish. The Congress government took a decision to transport apple in corrugated boxes and today it not only captured the market but led to conserving forest wealth of the State. The Chief Minister said that the motto of such functions were to aware the people about the advantages of forest wealth vis-a-vis saving the fragile Himalayan ecology from degradation besides saving the environment. He remembered the then Union Agriculture Minister, KM Munshi, who in 1950 took the initiative in protecting and saving the forest wealth of the country. “I have committed my life to protect forest wealth of the State since I became the Chief Minister and to stop Van Mafia from exploiting our Jungles” he said adding that this has also helped in achieving carbon credit and we have achieved the distinction of being the first State in Asia to earn such credits. The Chief Minister said that Rs. 105 crore drinking water supply scheme (DWSS) was being implemented in Shimla Rural constituency benefitting people of 45 Panchayats for the years to come. He stressed for constructing check dams for irrigational purposes and adopting diary business. He exhorted the people to grow broad leaved and fruit bearing trees. He said that Rs 310 crore KFW German Project was being implemented in Chamba and Kangra districts to ensure increase in green cover and save flora and fauna from the changing climatic conditions. He said that with the efforts of the State government, the issue regarding granting sanctioning permission for carrying out development activities on forest land upto one hectare now rests with the State government and around 82 cases of forest clearance were given by the State government last year.